Carlex Design is rolling out tuning program after program as of late. Carlex Design has been churning out their tuning programs thick and fast as of late, with programs based on the Maserati GranTurismo and the Rolls-Royce Ghost. The Polish tuning team has returned with a very distinct and clever MINI Countryman which pays tribute to the genre of Steampunk. 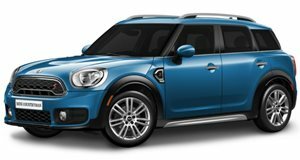 The Steampunk MINI Countryman features a satin gray exterior finish with a contrasting copper color on the wheels, roof, door handles and side stripe. The headlights and taillights have both been blacked-out for a very unique and interesting appearance. The interior is basically the dictionary definition of Steampunk, blending the new and old together seamlessly. Old timey brown leather has been affixed to the seats and dashboard, while a gorgeous wood has been laid on the floor and on the back of the odometer. Copper plating covers the pedals, instruments, air vents and even the steering wheel.The steering wheel and seat cushions feature a see-through design allowing one to see the mechanicals of the car in a very Steampunk fashion. Check out Carlex Design&apos;s clever MINI Countryman in the gallery below and let us know what you think about the Steampunk-inspired British hatch.